Imagine a hypothetical SaaS startup. The business has just released its product and has one fully ramped account executive with a quota of $600,000. On average, this account executive and all future once hired attain 75% of their quota. The company suffers a revenue churn of 0.5% per month, and has no account expansion. In addition, the startup continues to hire account executives at a pace of one per quarter in the first and second years, and two per quarter in the third and fourth years. The table above summarizes the company’s growth. Annual recurring revenue at year-end surges from $1.5M at the end of year one, to $5.4M in year two, to $13.1M in year three and $26M in year four. The last line of the table conveys the renewal revenue as a percentage of revenue, net of churn. Within four years, that figure rises from 0% contribution to nearly 50%. 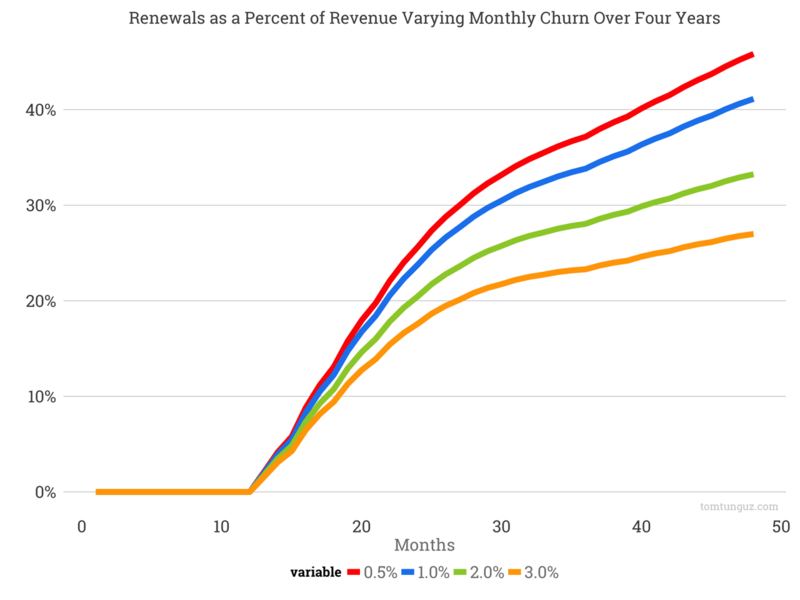 The chart at the top of this post compares the revenue contribution from renewals across four different monthly revenue churn rates: 0.5%, 1%, 2% and 3%. As the churn rate increases, the startup retains less revenue over time diminishing the share of renewal revenue. Across that spectrum of churn rates, the year 4 share of revenue from renewals drops from 46% to 28%. Startups that grow faster will also observe a slower growth rate in their share of revenue from renewals as bookings strives to keep pace with the expanding existing customer business. As a maturing SaaS company approaches 50% of revenue generated from renewals, customer success should rise in strategic importance to the business. After all, customer success generates half of the company’s revenue. In addition, as the startup develops new products and/or capacity to expand accounts, the customer success team new bookings also becomes a material consideration. And the VP of CS contributes as much revenue as the VPS. If the company can engender a 30% negative churn in their customer base, similar to Box at IPO, then in year four, the customer success team piles another $5.9M in new bookings on top of the $21M bookings from the 24 member sales team, a 28% boost. This is the power of the compounding effect of SaaS companies’ subscription models. Like high interest bank accounts, the core of the business continues to grow and becomes an increasingly invaluable opportunity, one that requires a strategic shift in thinking to seize.